The purpose of the WNYDA Awards Program is to recognize member achievements during the competition year. Awards will be presented at the Annual WNYDA Awards Banquet. COMPETITION YEAR: The WNYDA 2019 competition year runs from October 1, 2018 to September 30, 2019. · The owner(s) & rider of the horse must be a WNYDA member in good standing at the times scores are earned. A WNYDA member who leases a horse is considered to be the owner. · If the owner completes the required eight volunteer hours, then their horse is eligible for Horse of the Year Awards, but the rider is not eligible for the Rider of the Year Awards, unless the Rider has also completed the required eight volunteer hours. · It is the rider’s responsibility to submit scores to the Scorekeeper, for WNYDA and non-WNYDA show scores. Only scores submitted to the Scorekeeper by October 10 of the current competition year count toward awards unless otherwise stated. You must use the WNYDA Score Reporting Form found in the forms section at the back of the Omnibus (or in the forms section of the web site) to report your scores. You must send copies of the front pages of tests clearly showing the judge’s signature or a print out from the USDF Score Check Website and the final score to the Scorekeeper with your Score Reporting From to be eligible for Awards. Scores will not automatically be submitted to the Scorekeeper on the rider’s behalf, except for the WNYDA Challenge Series Shows. It is your responsibility to submit scores for award qualification. · The age of the rider must be recorded with the WNYDA Scorekeeper if the rider is competing for Junior/Young Rider, Vintage Cup Awards and Junior and Senior Challenge Series Show Divisions. · Challenge Series Show scores count for the WNYDA Challenge Series awards and the Flying Change Horse of the Year Award (if required USEF/USDF scores are also earned) and the Upstate GMO Schooling Show Achievement award if additional score requirements from a 2nd participating GMO are also received. (see section I. for qualifying requirements). · Only scores from USEF/USDF Recognized Competitions count toward awards for Rider Achievement, Horse of the Year, Rider of the Year, Joint Upstate High Point, WNYDA Opportunity Rider of the Year and Flying Change Horse of the Year (if required Challenge Series scores are also earned). Breeding Division score must be from a USEF Licensed DSHB Judge earned at a USEF/USDF recognized show. At least one of the scores submitted must be from a WNYDA Sponsored Recognized Competition to be eligible for WNYDA awards and Flying Change Horse of the Year Awards. A WNYDA Sponsored Recognized Competition is one with the WNYDA name and logo in the prize list. · Classes restricted in any way, i.e. Breed, Novice, Opportunity, etc. do NOT count unless otherwise noted. Scores from Amateur Classes DO count toward WNYDA awards, except where noted otherwise. Scores from Opportunity Classes in USEF/USDF shows count ONLY for WNYDA Opportunity Rider of the Year, but no other awards. · Awards are based on a median score, which is the middle score when all scores are placed in numerical order (except the Upstate GMO & Joint Upstate High Point; they use the average). · Awards will only be presented to median scores of 55% or higher (except for Challenge Series and Flying Change Horse of the Year). And an average score of 60% for the Upstate GMO & Joint Upstate High Point. · For each category, a minimum of 4 scores of 60% or higher must be recorded from 2 different competitions and 3 different judges. At least one score must be from a WNYDA Recognized Sponsored Competition. · For Training through Fourth Level, one score for each level must be from the highest test at that level. · Riders are responsible for submitting their scores to the scorekeeper on the Rider Achievement Award Form (found in the forms section at the back of the Omnibus or on our website at www.wnyda.org), along with the required volunteer hours form. · Awards may not be won by the same rider/horse combination at the same level more than once. · Only those Riders qualified for a Horse of the Year Award will also qualify for a Rider of the Year Award. · Awards are determined based on the scores submitted for the Horse of the Year awards, as long as the rider has completed the required volunteer hours. The Rider with the highest median score regardless of level is presented with a trophy as noted below. This award is given to any member with the highest median score from the winners of the Open/Professional, Vintage, Adult Amateur and Junior/Young Rider Awards. This award is given to any Junior / Young Rider member with the highest median score. A competitor is a Jr/Young Rider until the end of the calendar year in which he/she reaches age 21. Scores must be earned in Open or Junior/Young Rider classes for the Junior/Young Rider Award. This award is given to any member with the highest median score who has reached 50 years of age as of December 1 of the previous year. Scores must be earned in Open or Adult Amateur classes for Vintage Cup. This award is given to any Adult Amateur member with the highest median score. A competitor is an Adult Amateur if they hold a valid USEF membership card with Adult Amateur status. A competitor is an adult from the beginning of the calendar year in which he/she reaches age 22. Scores must be earned in Open or Adult Amateur classes for Adult Amateur. This award is given to any Professional member with the highest median score. A competitor is a Professional if they hold a valid USEF membership card with Professional status. Scores must be earned in Open classes only for the Open/Professional Award. These awards recognize achievements of the horse, regardless of the rider in a given competition year. Awards are given at each level for Training through Fourth, one award for FEI levels and one Musical Freestyle Award. Qualifying Requirements: (see rules regarding Eligibility and Score Requirements in Section I. AWARDS CRITERIA). No rider/horse combination may win Horse of the Year at the same level more than once. At FEI and Freestyle, a horse may win Horse of Year more than once if qualified at a higher level. · All scores must be from recognized USEF/USDF Competitions. Scores must be submitted on the WNYDA Score Reporting Form along with copies of the fronts of the tests and postmarked to the WNYDA Score keeper by October 10 of the competition year to be eligible, along with the required volunteer hours form. a. Training, First and Second Levels – submit 5 scores only from at least 2 shows, 3 different judges. One of the scores submitted must be from a WNYDA Sponsored USDF/USEF recognized show. Two of the scores submitted must be 55% or higher from Test 3 of that level. b. Third and Fourth Levels – submit 3 scores only from at least 2 shows, 3 different judges. One of the scores submitted must be from a WNYDA Sponsored USDF/USEF recognized show. One of the scores submitted must be 55% or higher from Test 3 of that level. c. FEI and Freestyle (all levels) – submit 3 scores only from at least 2 shows, 2 different judges. One of the scores submitted must be from a WNYDA Sponsored USDF/USEF recognized show. The Horse with highest median score at each level noted is presented with a trophy. These awards recognize rider achievement, regardless of the horse(s) ridden in a given competition year, at the WNYDA CHALLENGE SERIES shows. Qualifying Requirements: (see rules regarding Eligibility and Score Requirements in Section I. AWARDS CRITERIA) Every Challenge series show will have JR and SR divisions. A Junior is 21 and under, a Senior is over 21 years of age. · Minimum of 3 scores from at least 2 different challenge series shows for any test at the same level at a WNYDA Challenge Series Show is required to qualify. Riders may qualify at more than one level if the minimum of 3 scores (from at least 2 different challenge series shows) per level is met. · Award champion and reserve champion for JR and SR at each level. All other qualified riders get a certificate of recognition. · The median score will be used to determine award winners – all scores from WNYDA Challenge Series shows will be used in calculating the median. Challenge series secretaries will submit scores on behalf of all riders. Riders do not need to submit scores. · Riders must provide proof of eight volunteer hours worked by sending a completed and signed volunteer hour form to the Scorekeeper by October 10 of the competition year to be considered eligible for this award. The rider with the highest median score is presented with a trophy. This award recognizes the qualifying colt, gelding or filly from 1 to 3 years of age, and stallions and mares 4 years old and older, in a given competition year. Qualifying Requirements: (see rules regarding Eligibility and Score Requirements in Section I. AWARDS CRITERIA). The final test score with total adjusted points (for conformation, movement and general impression) from a USDF Sport Horse Breeding Stock or Prospect (In-Hand) individual score sheet signed by the judge must be submitted. The highest overall score will count as long as the horse was also shown at the WNYDA Breed Show. Scores from a IBC Class and the Region Finals Class are excluded. · Score must be submitted on the WNYDA Score Reporting Form along with copy of the front of the test and postmarked to the WNYDA Score keeper by October 10 of the competition year to be eligible, along with the required volunteer hours form. · Horse must be owned by a WNYDA member in good standing, but may be shown (handled) by a non-WNYDA member. Recognized Judge, is presented with a trophy. Donated by Black Points Farm. The Darla Award is a trophy donated in 1999 by a group of friends in memory of Darla Schwark, a former Mendon Pony Clubber who went on to major league dressage in the Gladstone, N.J. area until her untimely death in 1998, at the age of 30. While still living in this area, she was involved with many of us, training and teaching both horses and riders. After moving to N.J., she made frequent return trips to visit family, and continued to teach and inspire. This trophy will be awarded to the rider with the highest FEI score of 60% or higher (not including Musical Freestyle) from the WNYDA Summer Festival show who is an active WNYDA member at the time of the competition. This Trophy will be awarded at the WNYDA Awards Annual Banquet. This award recognizes riders and their horses making the transition from schooling to recognized shows. Qualifying Requirements: (see rules regarding Eligibility and Score Requirements in Section I. AWARDS CRITERIA). · Minimum of 2 scores, from any test, at the same level from WNYDA Challenge Series Shows AND a minimum of 2 scores, from any test, at the same level from recognized USEF/USDF Competitions is required to qualify. · One of the scores submitted must be from a WNYDA Sponsored USDF/USEF Recognized show. · All scores must be earned by the same Horse/Rider team. · Awards will only be presented to median scores of 60% or higher. · The JR and SR (JR is 21 and under, a SR is over 21) with the highest median score, regardless of level, is presented with an award. · Scores must be submitted on the WNYDA Score Reporting Form, along with copies of the fronts of the tests, and postmarked to the WNYDA Score keeper by October 10 of the competition year to be eligible. · Award may not be won by the same horse, at the same level, more than once. This award recognizes less experienced amateur riders in a given competition year. Qualifying Requirements: (see rules regarding Eligibility and Score Requirements in Section I. AWARDS CRITERIA) An Opportunity Rider is one that enters Opportunity classes in WNYDA USEF/USDF Recognized Dressage Competitions. · Rider must be an amateur and not a professional (a professional is someone who receives remuneration for having or sharing the responsibility for instruction, teaching, schooling, coaching or advising any rider on the training of any horse at any time, past or present). Scores must be submitted on the WNYDA Score Reporting Form along with copies of the fronts of the tests and postmarked to the WNYDA Score keeper by October 10 of the competition year to be eligible, along with the required volunteer hours form. A minimum of 4 test scores from at least 2 different competitions and 2 different judges from the WNYDA Opportunity Classes offered at WNYDA Sponsored USEF/ USDF Recognized competitions. A rider may not win this award more than once. The rider/horse combination with the highest median score, is presented with a trophy. This award recognizes riders and their horses from all levels – Introductory and up with scores from GMO sponsored Schooling Shows. Only one award will be given regardless of age or level. Qualifying Requirements: (see rules regarding Eligibility and Score Requirements in Section I. AWARDS CRITERIA). · Criteria and Process: Submit two scores from a GMO sponsored schooling show of 60% and above from two different judges from two different GMOs. · Participating GMOs for this award are: Western NY Dressage Association, Cayuga Dressage & CT, Central NY Dressage & CT.
· Report scores to the score keeper using the Upstate GMO Schooling Show Achievement Award form found in this Omnibus. This award recognizes riders and their horses from all levels – Introductory and up with scores from USEF/USDF Recognized Competitions. Only one award will be given regardless of age or level. Qualifying Requirements: (see rules regarding Eligibility and Score Requirements in Section I. AWARDS CRITERIA). · Criteria and Process: Submit 4 scores from USEF/USDF sponsored competitions at the qualifying level at least 2 of the scores must be from 2 different participating GMO sponsored shows (participating GMOs for this award are: Western NY Dressage Association, Cayuga Dressage & CT, Central NY Dressage & CT) and 3 different judges. One of the scores submitted must be from Test 3 of that level. The 4 scores will be used in calculating the average (mean) score. · Only averages of 60% or higher qualify, with the same rider/horse combination. · Opportunity classes do not count towards this award. · Report scores to the score keeper using the Joint Upstate High Point Dressage Award form found in the Omnibus or on our website. This award recognizes the qualifying horse in a given competition year competing in the Materiale Classes. Qualifying Requirements: (see rules regarding Eligibility and Score Requirements in Section I. AWARDS CRITERIA). The final test score with total adjusted points from a USDF Materiale score sheet signed by the judge must be submitted. The highest overall score will count. · For 2019 competition year: Only one score should be submitted from a USDF DSHB Judge needs to be submitted. This can be from any USDF Recognized Breed Show. · Owner and Rider must be a WNYDA member in good standing at the time score is earned. Sponsored by Kait Webster and Equine Exposure LLC. This award recognizes any horse/rider combination of a WNYDA member in good standing competing on an OTTB (Off the Track Thoroughbred). Qualifying Requirements: (see rules regarding Eligibility and Score Requirements in Section I. AWARDS CRITERIA). Award is based on median score (the middle score when all scores are placed in numerical order). Recipient will be awarded a high point award and ribbon. · This award is open to all levels and categories of riders (Junior, Senior, Open, Adult Amateur) and any level of horse (Intro through FEI).
. Submitted scores must all be from the same level.
. Scores must be earned at any WNYDA USEF/USDF Recognized show or any WNYDA Challenge Series show or any combination of those two.
. Three scores must be submitted from at least 2 different judges. · Score must be submitted on the WNYDA Score Reporting Form along with copy of the front of the test and the horses's Jockey Club papers and postmarked to the WNYDA Score keeper by October 10 of the competition year to be eligible, along with the required volunteer hours form. 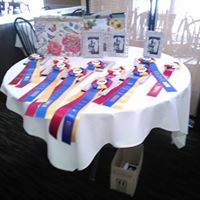 · Winner of the OTTB Incentive Award will be awarded a high point award and ribbon. Only 1 award will be given out, regardless of rideer status and/or level. Please note that in 2012 all original Perpetual Trophies that had been donated were retired. These trophies will be displayed at Houghton College in their new indoor facility display once it is completed. This will allow for all competitors to be awarded with a keeper trophy at the annual awards banquet that they can take home to display as they choose. WNYDA offers a variety of awards to our members. Carefully review all the criteria and submission requirements. Eight hours of volunteer service is required to be eligible for awards. If you are not sure where to volunteer, fill out our volunteer form.